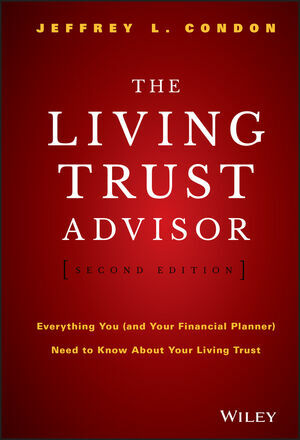 The Living Trust Advisor is an expert guide for both advisors and their clients on the complex process of establishing, living with, and maintaining a living trust. Written by renowned family inheritance attorney Jeffrey L. Condon, this book discusses the various aspects of this important document, and shows you how to manage a seamless transfer of assets to various beneficiaries. This new second edition has been fully updated and revised to reflect the extensive changes to the Estate Tax Law that have taken place since the initial publication, giving you the most up-to-date information and guidance on preserving your wealth and helping your heirs avoid estate tax liability. You'll develop a vision for your trust before you ever meet with an attorney or other key players, and learn how to establish and maintain a trust that remains rock-solid for your lifetime and beyond. As the living trust has replaced the will as the primary means of settling after-death estates, clear guidance and current legal information is of utmost importance for advisors and clients alike. This book is a valuable resource for every stage of planning and execution, helping you ensure that you provide for your beneficiaries the way you intend. Dealing with complex financial and legal issues while facing our own mortality is a difficult task, but making these decisions is critical to the future outcome of your estate. The Living Trust Advisor expertly guides you through the process so you can be confident that your wishes will be carried out. JEFFREY L. CONDON, ESQ. has practiced in trust, estate, and probate law since 1987 at the law offices of Condon & Condon in Santa Monica, California. With his late father, Gerald M. Condon, he is the coauthor of Beyond the Grave: The Right Way and the Wrong Way of Leaving Money to Your Children (and Others), the bestselling inheritance planning book in American publishing history, which the Wall Street Journal called the "best estate planning book in America." When not tending to his clients' Living Trusts and inheritance matters, Jeffrey enjoys swimming 3,000 meters daily with Southern California Aquatics, dining with his lovely girlfriend, Kim, listening to '70s and '80s pop music, getting together with his lifelong friends, and finding opportunities to spend quality time with his grown children.